WASHINGTON — President Donald Trump’s national security adviser on Sunday left open the possibility of additional U.S. military action against Syria following last week’s missile strike but indicated that the United States was not seeking to act unilaterally to oust Syrian President Bashar Assad. In his first televised interview, H.R. McMaster pointed to dual U.S. goals of defeating the Islamic State group and removing Assad. But he suggested that Trump was seeking a global political response for regime change from U.S. allies as well as Russia, which he said needed to reevaluate its support of Syria. 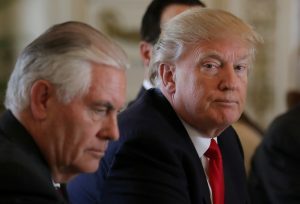 Their comments came as Tillerson was making the Trump administration’s first official trip this week to Russia, a staunch Assad ally. In interviews broadcast Sunday, Tillerson said defeating the Islamic State group remains the top focus. Once that threat “has been reduced or eliminated, I think we can turn our attention directly to stabilizing the situation in Syria,” he said. “We’re hopeful that we can prevent a continuation of the civil war and that we can bring the parties to the table to begin the process of political discussions” between the Assad government and various rebel groups.